Formerly known as East Las Vegas, the town of Whitney is just a 20 minute drive from the Las Vegas Strip. Not long ago, the area boasted a robust economy thanks to abundant jobs in Las Vegas, but during the recent economic downturn the tourism industry was hit hard and those jobs dried up. Especially for the 18.4% of adults without high school diplomas, making a living has never been harder. Since the early 2000’s, Whitney has seen its poverty rate climb by nearly 50%, while its population has more than doubled. 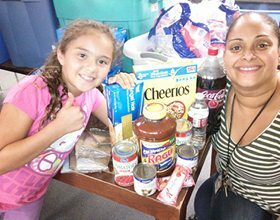 In Whitney, Family-to-Family partners with Albertson’s grocery store to provide groceries for our sponsored families. Click here to watch a CBS News piece about how families at Whitney Elementary School are struggling to overcome poverty.